When I spoke to my mum about this piece she said ‘I never use squash or pumpkins, aren’t they a bit like marrow?‘ Which just goes to show that the whole idea of using squash and pumpkins in recipes are a fairly recent import from the USA. Pumpkins don’t have a reputation for good eating here because shops tend to stock primarily the large classic orange ones, the Jack O’lanterns. These are only good for carving as their flesh tends to be stringy and watery. But nowadays, there is an abundance of sweet, dense-fleshed, tasty squash around. Use every part of the pumpkin. You can save the seeds and roast them. Just brush/scrape off most of the flesh, give them a quick wash and roast with a little salt and olive or pumpkin seed oil. I use pumpkin seeds in bread or scattered over salads. The skins or shells are effective as bowls for soup or as below, for a soufflé. The flowers can be used for a Mexican squash flower soup. Squash is also a brilliant carbohydrate filler for those who are gluten free. 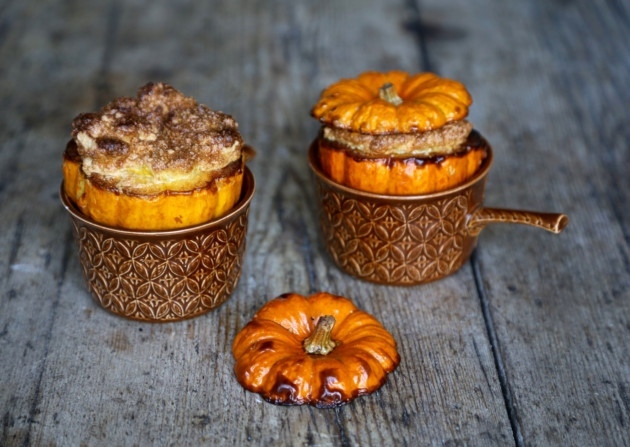 For the best tasting winter squash, experiment with some of the other cultivars available. Butternut squash. I love it roasted and tossed into salads or served with couscous, a few pomegranate seeds and parsley. The ‘coquina’ variety is nicely sweet. Spaghetti squash. Once baked, the centre can be forked into spaghetti-like strands. You can treat it like courgetti, a gluten-free replacement for pasta and the latest trend for fashionable ‘clean’ eaters. Or add lashings of salty butter and parmesan, as I do. Tromboncini. Trombone-shaped Italian squash. When young, slice up and use like courgette; when older, use like squash. Gem squash. Wonderfully sweet: stuff and bake. Acorn squash. Another small squash. Can be pureed into soup or stuffed. Onion squash. Small, baked, mixed with cheese. This is great on toast. Kabocha squash. Popular in Japan. Perfect simply roasted with soy sauce, ginger, sesame seeds and served with sushi rice. Hokkaido. Teardrop-shaped, deep red/orange squash. Use in a tart, a soup or simply roasted. Delicata squash. Italian from Lombardy. Difficult to find in the UK but it’s easier to chop up than other squashes and the skin is edible so no peeling required. Roast with a little salt. Crown Prince. Large blue/grey skinned squash with sweet orange flesh inside. Harlequin. Pointy decorative squash is also good to eat. Turban squash. Spectacular – looks just like a Turkish hat. One of my favourites is the munchkin pumpkin, the size of a cricket ball, available at most large supermarkets around this time of year. Their flesh is reminiscent of chestnuts. 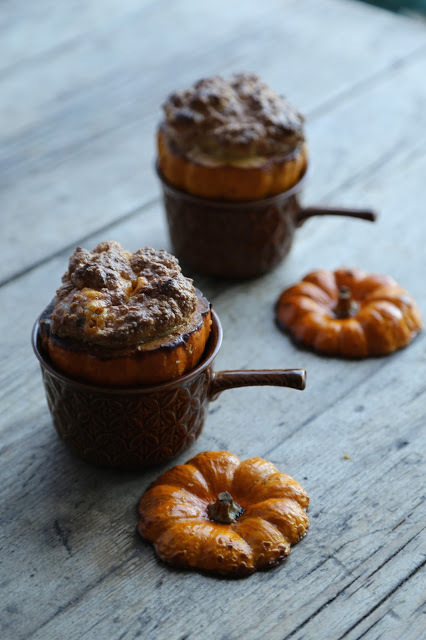 This recipe makes a lovely starter for a dinner party or an adult dish for Halloween parties. I’ve noticed that children like them too – there is something of the fairy tale about a pumpkin. Go to my column at the Ham and High newspaper for the recipe. 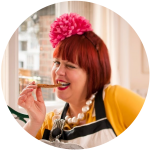 29 November: MsMarmitelover’s gardening supper club, The Secret Garden Club – Grow your own curry! Learn how to grow ginger, lemon grass, garlic, turmeric, kaffir lime leaves, fennel seeds and more, plus enjoy a homegrown curry lunch. Tickets £40. BYO or order from winetrust100.co.uk.